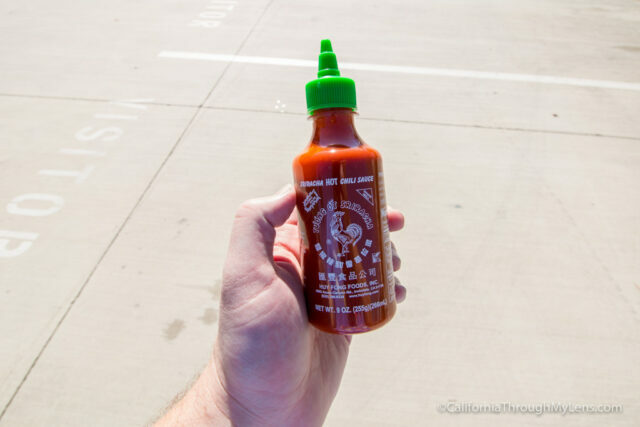 If you have been to a Chinese food restaurant, then you have no doubt seen/experienced the spicy goodness that is Sriracha. 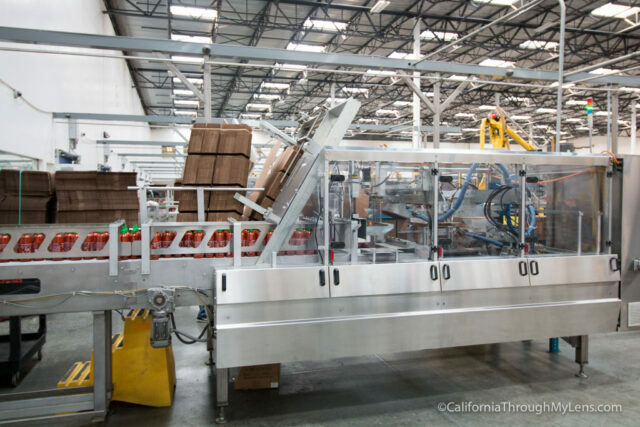 The iconic plastic bottle with the rooster on the front and the green top is one of the most popular condiments in the USA, and it is produced right here in Southern California. I got a chance to take the tour of the facility, and you can read all about it below. 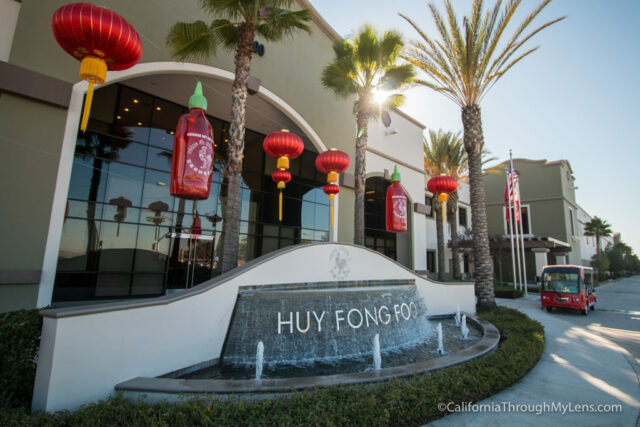 The Huy Fong Factory is located right off the 10 Freeway. 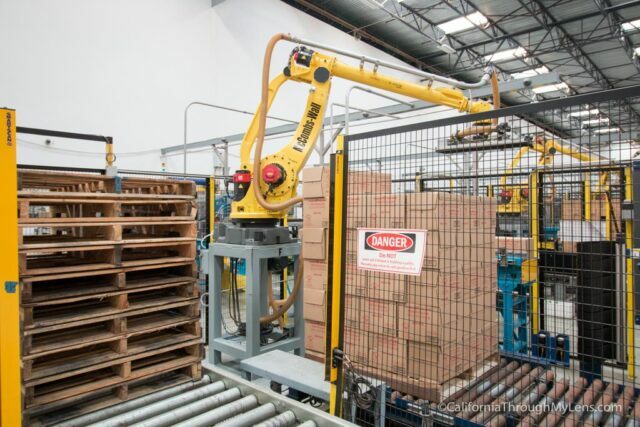 It is in an industrial area as the building itself is over 650,000 square feet. There is plenty of parking for visitors so you shouldn’t have trouble finding a place to park. Here is a video I made of the tour. 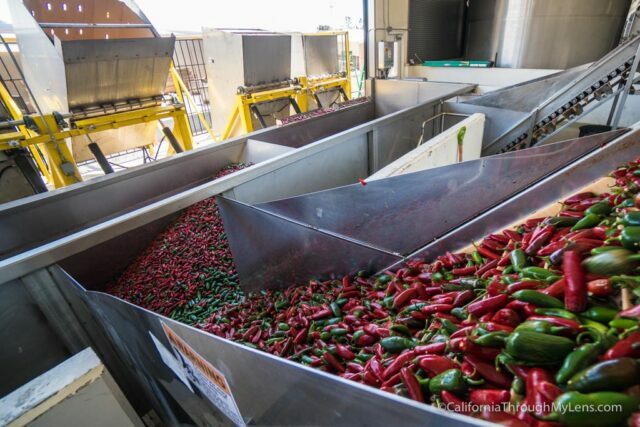 Once a year, for four consecutive weekends, the Sriracha factory opens for chili grinding. 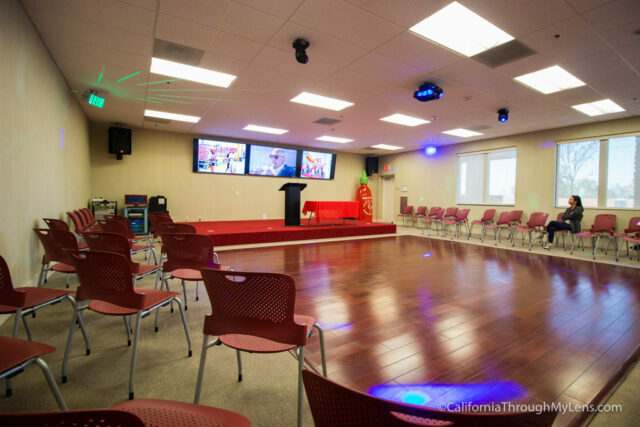 This open house is a ton of fun and if you get a chance to go, then do it. It feels like a party when you go with music, lion dancers, food and free gifts. Here is a video I made of my time at the chili grinding in 2017. 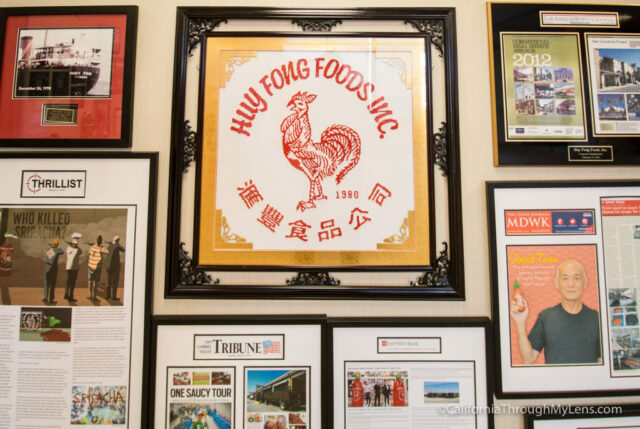 Huy Fong is the name of the ship that brought the owner over from Vietnam, so he named his company after it since it brought him to a new life. 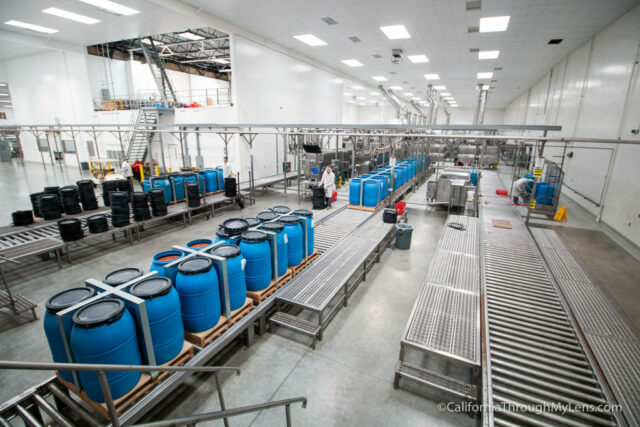 They use 100 million pounds of chili in a season, and it comes from only one farm. 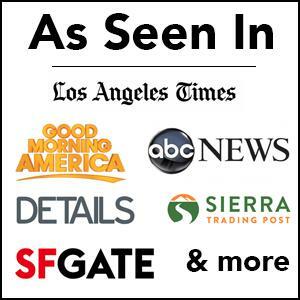 They have been in business for 36 years and just sell to wholesalers, not end users. The company hasn’t added a new customer for 11 years since they are kept at full demand. 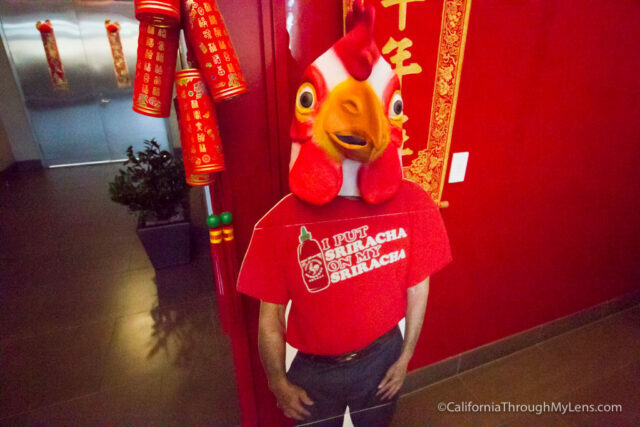 This room also had a lot of pictures from the way Sriracha has connected with popular culture over the years. There is a cartoon from The Oatmeal and even a photo of Sriracha floating in zero gravity on the international space station. 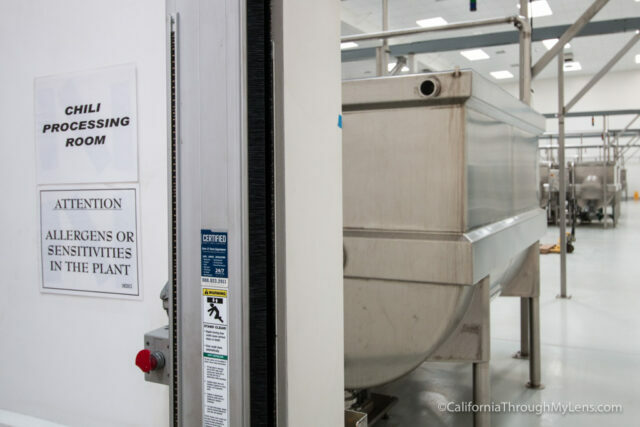 After hanging out in here, the tour began with hair nets and jumping on a golf cart with the license plate “hot one.” The golf cart took us around to the back of the factory and we started the 25 minutes of walking through the world of sriracha. My tour guide was named Claudia and she was great! During the chili crushing season (fall) there is a ton more going on then there was when I went, so keep any eye out for those open houses. 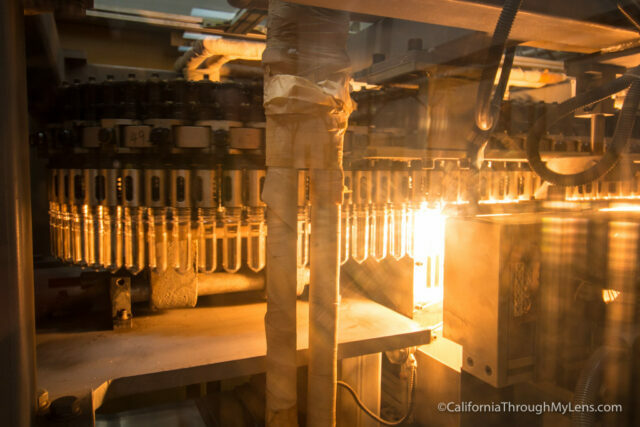 The tour takes you around the factory and you still see the process, but it is mostly focused on the bottling aspect. Our guide brought a microphone, but the factory is loud that it is pretty hard to hear. This didn’t take away from the fun though as it is a well laid out tour that takes you to the main aspects of the line. 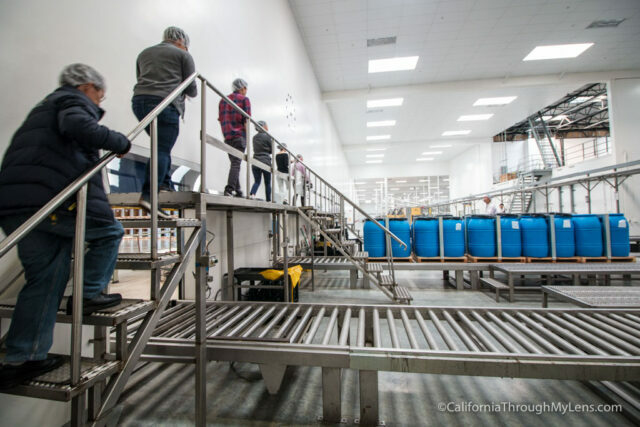 The best part is the bottling area where you see the small bottles that are expanded to their normal size and then filled. From here the bottles are stamped and the iconic green top is added. Next, they get put into a box and then the boxes get stacked and wrapped to prepare for shipment. 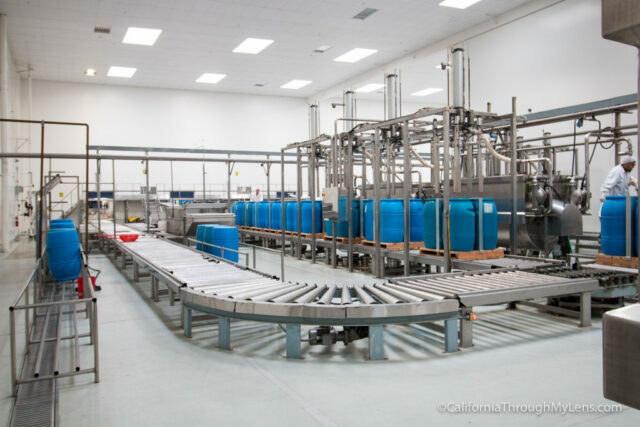 The processing line can produce up to 10,000 bottles an hour per lane and there are 9 lanes. 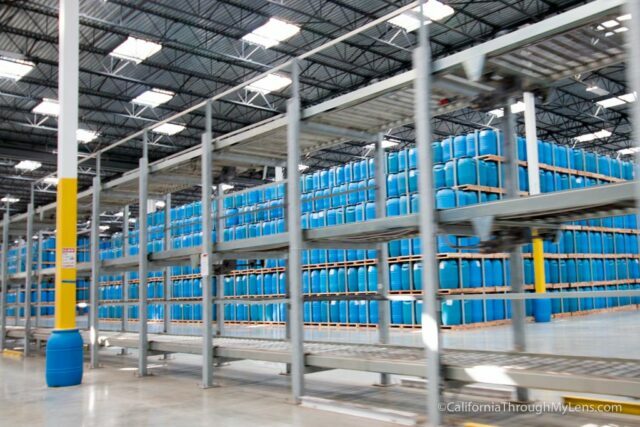 We then loaded back into the golf cart and were driven through the holding area where there are tens of thousands of blue buckets filled with the crushed chilis just waiting to be turned into Sriracha. 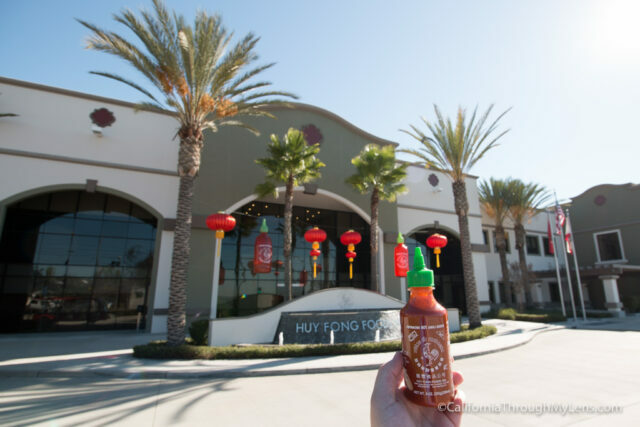 One of the things I learned is that there are many makers of Sriracha, but Huy Fong Foods are most recognized. The name is not trademarked but the rooster and the green cap of the bottle are. When you have a Sriracha burger at a restaurant it is most likely not Huy Fong Foods Sriracha unless you see one of their trademarks. 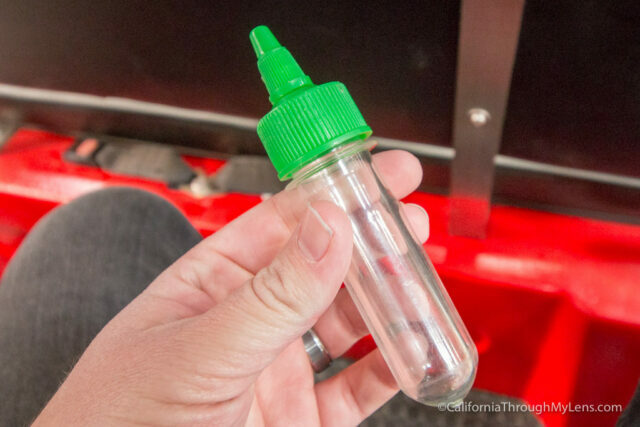 After the tour ends you will make your way to the gift shop where you are given a free small bottle of Sriracha. You can also purchase gifts from the wide range of shirts, pillows and other funky stuff they have. The gift shop is sold at cost, so they do not make a profit on anything here and because of that the prices are really great. I got a shirt for $10 which was impressive. 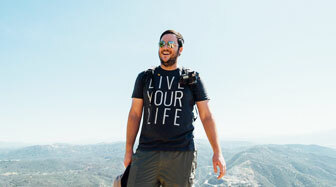 All in all, I am happy that I finally got a chance to visit this fun Southern California spot. 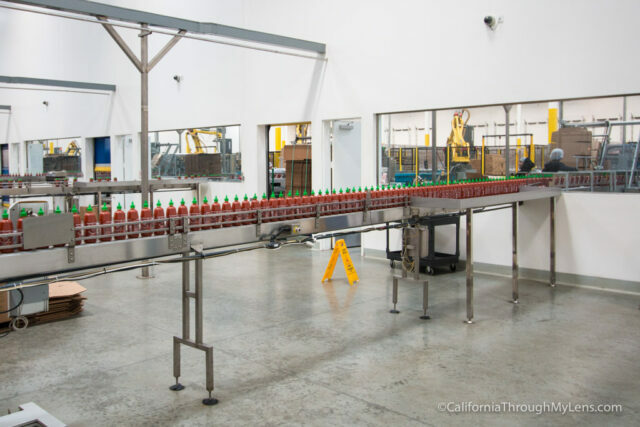 It is hard to beat a free tour where you get bottle of Sriracha at the end and I suggest you add this spot to your list of places to visit in California.